We’d love your help. Let us know what’s wrong with this preview of B.P.R.D. Hell on Earth Volume 1 by Mike Mignola. Guy Davis's final B.P.R.D. story sets the stage for Tyler Crook's (Harrow County) backwoods-horror debut, as Liz Sherman hides from a world that she hel The plague of frogs has ended, but earth will never be the same, and the fractured B.P.R.D. struggles to battle dangerous monsters and humans alike, from a trailer-park cult to a Russian town ravaged by a zombie-like virus. To ask other readers questions about B.P.R.D. Hell on Earth Volume 1, please sign up. Can I just start by saying I really miss Guy Davis? Tyler Crook is great, I have nothing bad to say about his art, but Davis really defined the B.P.R.D. for me. That said, I think the transition between the two went very well, and I can see Crook filling that role nicely in issues to come. I think my four-star rating reflects how emotionally wearying this volume was. I deliberately didn't read any of Hell on Earth because I like having the collected stories in one place, and this may have been a Can I just start by saying I really miss Guy Davis? Tyler Crook is great, I have nothing bad to say about his art, but Davis really defined the B.P.R.D. for me. That said, I think the transition between the two went very well, and I can see Crook filling that role nicely in issues to come. I think my four-star rating reflects how emotionally wearying this volume was. I deliberately didn't read any of Hell on Earth because I like having the collected stories in one place, and this may have been a mistake in this case because it was bleak. I kept going back and forth--old friends resurface, people suffer horribly, new characters emerge, and between all of that I think I just felt overwhelmed. I look forward to the next omnibus edition, and I'm so glad they're releasing them so closely together. Very excited that the collected volumes of BPRD: Hell on Earth are finally out! Another great series of Horror comics by a master of the genre... Mignola! While I'm not a fan of Horror movies or books these comics are really creepy and fun... this volume picks up where the four volume of the BPRD plague of frogs left off. Looking forward to reading volume 2 when it comes out in a few months! I'm starting B.P.R.D. Hell on Earth: Working on Book 1 of 15. This in some ways is the Climax of the Hellboy/BPRD Story (not in terms of conclusion) but a world where Hell is literally arrived and it has just been exposed to the world. Reality is fracturing and there are so many sinister plots in place that the BPRD will be stretched too thing and ultimately fail. Demons are no longer a subject of rumor and debate, and the world is changed here--hence the change in title from Plague of Frogs (wh I'm starting B.P.R.D. Hell on Earth: Working on Book 1 of 15. This in some ways is the Climax of the Hellboy/BPRD Story (not in terms of conclusion) but a world where Hell is literally arrived and it has just been exposed to the world. Reality is fracturing and there are so many sinister plots in place that the BPRD will be stretched too thing and ultimately fail. Demons are no longer a subject of rumor and debate, and the world is changed here--hence the change in title from Plague of Frogs (which was much more conspiracy theory-laden), this is the actual war and it's on many fronts. It's a series that has many ups and down, and Arcudi/Davis did a hell of a job keeping up the pace (in many ways it was superior writing to Mignola's Hellboy)--however with first the loss of Davis, then Arcudi (and several of the characters), the band can't keep playing for ever. Hell on Earth volume 1 marks a a big shift in tone and content for BPRD. It seems appropriate that long standby artist Guy Davis sees his work with the series come to and end here. Tyler Crook is a pretty admirable replacement, but Guy and Arcudi are BPRD and it's sad to see that team broken up. The tone is different here. The stories are often shorter and the action is more militarized. 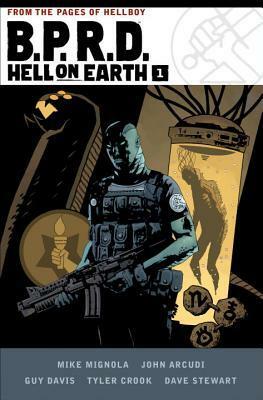 It becomes less of a horror adventure and more about solving the problem of the week for the BPRD in what is a Hell on Earth volume 1 marks a a big shift in tone and content for BPRD. It seems appropriate that long standby artist Guy Davis sees his work with the series come to and end here. Tyler Crook is a pretty admirable replacement, but Guy and Arcudi are BPRD and it's sad to see that team broken up. The tone is different here. The stories are often shorter and the action is more militarized. It becomes less of a horror adventure and more about solving the problem of the week for the BPRD in what is almost a post apocalyptic world. I'd be lying if I said I didn't miss the spirits and monsters from previous volumes. I'm liking Hell on Earth more than I thought I would. The transition from Guy Davis to Tyler Crook isn't too jarring. The story moves forward at a good pace. For a 400+ page hardcover, though, there isn't much of a payoff. A lot of stuff is set up that will presumably play out over the next few volumes. The sketchbook section at the end is nice. There's some text included with it that gives you some insight into the process of creating the creatures and characters. Overall, it's a nice package. I I'm liking Hell on Earth more than I thought I would. The transition from Guy Davis to Tyler Crook isn't too jarring. The story moves forward at a good pace. For a 400+ page hardcover, though, there isn't much of a payoff. A lot of stuff is set up that will presumably play out over the next few volumes. A strong continuation of the B.P.R.D series. Mignola and his team continue some of the threads leftover from the Plague of Frogs storyline while also setting up new and interesting plot pieces. The fate of Abe and the events in Russia leave the reader eager for the next volume. Great serialized storytelling. I had a blast reading this book!! I have a hard time articulating exactly why I love BPRD so much, but it is one of my favorite comics. I enjoyed reading about the repercussions of the Plague of Frogs and where it goes next.